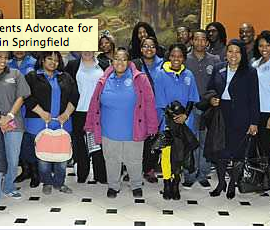 Education groups visited the statehouse on Tuesday to discuss the state’s funding of public schools. They came from all over the state, and voiced concerns to lawmakers. The concerns included the state’s failure to meet funding promises, and growing inequality of funding between districts. But lawmakers say there is at least one point of contention. “I maintain that even though we’re under these mandates, there are things you have an advantage in some of the flat grant districts that other districts don’t have,” said Rep. Al Riley (D-Olympia Fields).